Now that the weather is warming up – and the days are a bit dryer – people are sprucing up their homes. This usually involves spring cleaning, de-cluttering and having garage sales. I’ve had a garage sale or two in my day. I’ll be honest, it’s not my favorite thing in the world but it is a great way to get rid of extra stuff and make a bit of cash. One of the most difficult parts of garage sales – for me anyway – is pricing. I’m pretty sure this is because I think my old junk, is worth much more than I would want to pay for some one else’s old junk. Of course, it’s not — but it’s mine, so I am personally attached to it — which makes me think it is pretty much priceless. It’s almost like I am doing people a favor by allowing them to purchase my items. Too bad other people don’t quite see it my way. I also don’t like haggling. I always second guess myself. If I don’t accept someone’s offer I think, “Maybe I should have just taken it. Now I’m never going to sell this thing!” or if I do give in I think, “I could have gotten a lot more for that. Shoot! Why did I give in so easy.” What I have to keep reminding myself, is that people are paying me, to haul away the things my family and I don’t need or use anymore. When it comes to especially large items — this can be an excellent arrangement. I have also learned that there is a real art to this whole garage sale thing. Serious garage sale enthusiasts – both buyers and sellers – have a well thought out system and know just what they are doing. If you want to have a successful garage sale — you do too. Here are a few things I have learned from others and also from my own experience. You need to let people know that you are having a garage sale. If you think people don’t look at the newspapers to see where sales are — you are wrong. It is worth the investment. You don’t have to have a huge ad — just a simple one that lets people know what kind of items you are selling – and where to find you – is great. There are a lot of free ways to get the word out as well. Put your ad on Craigslist, create an event on Facebook letting your friends and family know about your sale, tweet it, tell everyone you can think of. Handing out fliers or placing them on community bulletin boards can be great ways of letting people know about your sale as well. The day of the Garage Sale be sure to post clearly marked signs so people can find you. Free standing signs are great and can be used again and again. If you get brightly colored poster board, that is effective in catching people’s attention as well. I don’t do a lot of shopping at garage sales, but when I have been out looking for things — an organized garage sale will make me stop. A disorganized or cluttered looking sale, has me hitting the gas peddle. See ya! If you want top dollar for your items — you need to make it look like they are worth it. Sort items by category, clean your items, hang up the nicer pieces of clothing you want to sell. Take pride in your stuff and others will see the value in it too. Organization is also important if you are having a multi-family garage sale. Make sure each person’s items are clearly marked. Using a different color of sticker – for each family – is very helpful. As I mentioned earlier – I’m not great at pricing my own items – but on FrugalDad.com, he has a great pricing guideline there, which you may find very useful. Something else that might be helpful, is to have someone else help you with the pricing. My Mom is fantastic at this because she has been to lots of garage, yard, and estate sales and she has a pretty good idea about how to price items to sell. My thought is, you can always mark things down later, especially if your sale is going to last a few days – toward the end of the sale if you are just wanting to get stuff out of your garage you might slash prices considerable the last day. Make sure you have enough change on hand, keep the cash box in a safe place (and makes “drops” when needed), use old grocery bags for people to carry their smaller items home in, and have newspaper available to wrap breakable items. 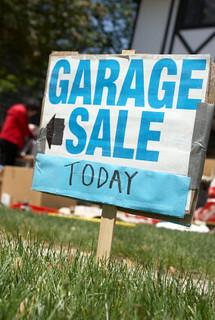 Do you have any helpful tips for people planning garage sales this year? Do you have tips for people shopping at these types of sales?